Ketchup and mustard, jam and jelly, hummus and baba ghanouj, condiments are always best when they come in pairs. 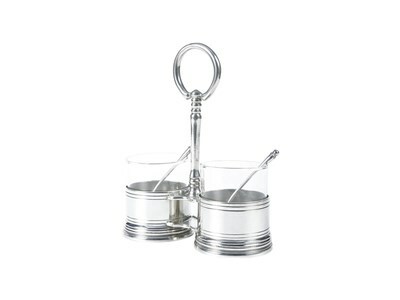 Our classic double condiment server is designed so your guests can choose at the table or buffet. A classically designed pure pewter basket holds the two clear glass condiment jars, and a spoon for each condiment. The basket is simply tooled and joined with an elegant banded handle that finishes with a loop for easy passing. A spoon for each jar comes with the set. 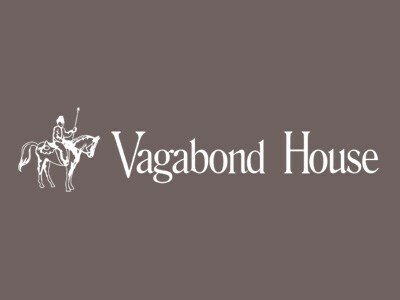 Deliberately unadorned, Vagabond House's Classic Pewter Collection is inspired by vintage pewter goods from both the old world and the new. Crafted following our belief that the basis of true luxury goods is a myriad of details, some so refined they cannot be seen, our Classic Collection pieces are destined to become heirlooms. Scroll to view all product options.